On Sunday 14 May 2017 from the Aboyne Community Centre, Bridgeview Road, Aboyne, Aberdeenshire, AB34 5JN cyclists can ride one of the most spectacular sportives in the UK. Ride the original King of the Mountains Sportive. Two of Scotland�s toughest road routes take you up steep mountain passes and down sweeping descents. Experience the stunning landscapes of the Cairngorms National Park and Royal Deeside. Now with a new improved route based in Aboyne that finishes with a fantastic 20km downhill section along the southern banks of the River Dee! Participants can ride solo or join with friends and colleagues to experience the stunning landscapes of the Cairngorm National Park, Royal Deeside and Donside. 100 mile route: 110 mile route: An epic, remote adventure. If you love a 3,700m climbing challenge you�ll love this journey. Six major climbs rewarded by long flowing descents winding through Scotland�s whisky country. 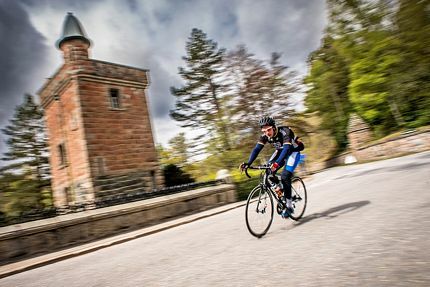 Rolling by distilleries, castles, rivers and lochs this is the connoisseur�s sportive through the best of Highland Scotland. 100 km route: The �up River Don and down River Dee� classic, this ride takes in 1,900m of climbing with mountain views of Lochnagar and the Cairngorms. Spin out through beautiful Donside, then return over the challenging Gairnshiel pass. The reward is one of the best road descents in Scotland � enjoy the view as you fly downhill towards Deeside!